Part number 552954-608 metallic gold ribbon for Datacard SP35 Plus, SP55 Plus and SP 75 Plus card printers. 1500 images. REPLACEMENT RIBBON SHIPPING FOR THIS PART NUMBER IS 532000-055. 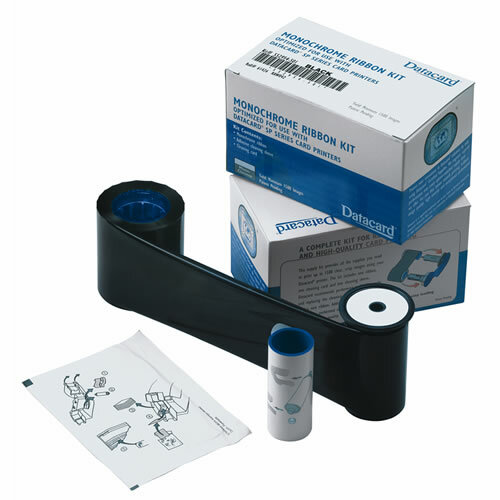 The ribbon kit contains essential cleaning supplies for the SP35 Plus, SP55 Plus or SP75 Plus Datacard ID card printers. One ribbon, one cleaning card and one cleaning sleeve is provided in part number 552854-608. When a Datacard ribbon is loaded into the Datacard printer, the printer driver automatically adjusts printer settings to match the ribbon type, helping to ensure the best possible image quality on the cards. The printer and supplies continue working together to track print ribbon consumption and to notify you of upcoming ribbon replacement.